The current Prattville First United Methodist Church sanctuary was completed in April of 1913. In the years up to 1964, First Methodist was fortunate to have a tracker organ, which was located against the back wall of the choir loft. A substantial renovation of the sanctuary was undertaken in 1964 and a new, seven-rank, two manual Reuter organ was installed by that summer. The organ was located in the front of the choir loft, recessed several feet into the floor, and faced the back of the loft, probably to accommodate a choirmaster. Some years later, this arrangement proved unsatisfactory and a group of the men in the church successfully lifted the organ and turned it to face the congregation. As the congregation increased and the music program of the church grew, the aging Reuter needed more repairs. The extensive organ leather works, which traditionally last twenty-five years, were now over forty years old and needed replacement, and the small organ was no longer adequate for the expanding music ministry. In 2007, an organ committee was assembled and Albert Striplin was elected chairman. Robert Capra of R. G. Capra Organs became a consultant for the Organ Committee who quickly witnessed presentations by representatives from several pipe organ companies. When the Committee realized that a pipe organ with the capabilities needed by First Methodist was not financially feasible, Mr. Capra then introduced the committee members to the idea of a digital organ that could be personalized to our needs. Walker Technical Company is the leader in digital enhancements for pipe organs in the United States and was highly recommended not only by Mr. Capra but also by Dr. Harald Rohlig, organ professor emeritus at Huntingdon College, where several digital stops had been added to the large pipe organ in Ligon Chapel since there was not enough space to add more pipes. The company has also installed a significant part of the digital enhancements of the two largest drawknob consoles ever constructed, one of which was built for Forrest Burdette United Methodist Church in Hurricane, WV. Mr. Capra then submitted three plans and their costs for the digital organ to the committee. After careful study and deliberation, one was selected and submitted to Walker Technical Company. 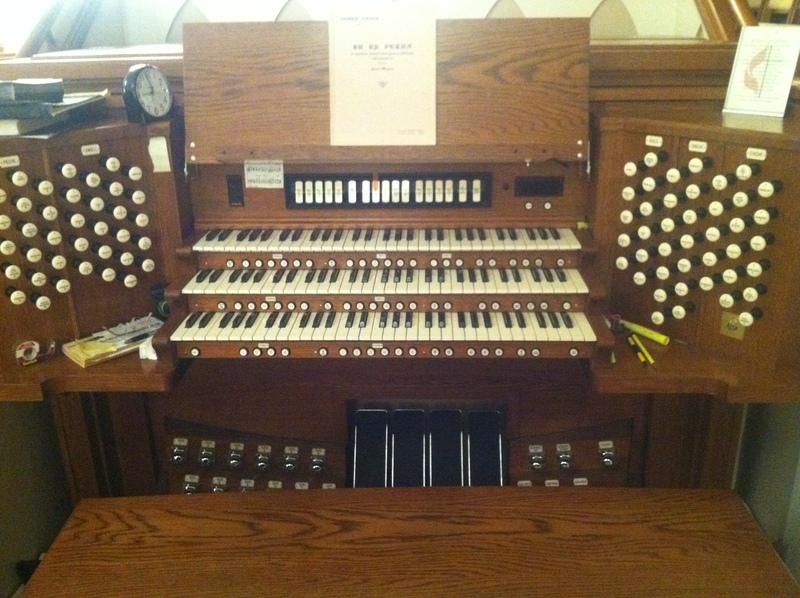 Our Walker Digital Organ has three manuals with a fourth manual embedded in the third manual, a full pedal board, toe pistons for the twelve general thumb pistons, sixteen memory banks with the capacity for 168 piston settings in each bank, and an organ console designed and built by expert craftsman Jim Schmidt. The digitally reproduced pipe sounds for our 79 stops come from some of the great organs of Europe. The aging Reuter was removed on the last Sunday in December, 2007, and a renovation of the choir loft began the following Monday. By the middle of February 2008, the sanctuary renovations had been completed, and the new Walker Digital Organ was installed and voiced to the sanctuary by Mr. Bob Walker and his assistants. Dr. Harald Rohlig sat at the console for the final voicing. A week after its initial service, the community was introduced to the new renovations and magnificent organ during a service of thanksgiving that celebrated no loss of life after a tornado ripped through a highly populated area of Prattville.